If you’re looking for ways to celebrate Christmas in Kitsap County, we’ve got five ideas to help you feel that holiday cheer. 1) The first is likely already on your list – go and get a Christmas tree! Here in the Pacific Northwest, there’s no shortage of places to get one. Vendors are set up in every major shopping area, and the big box stores carry them as well. 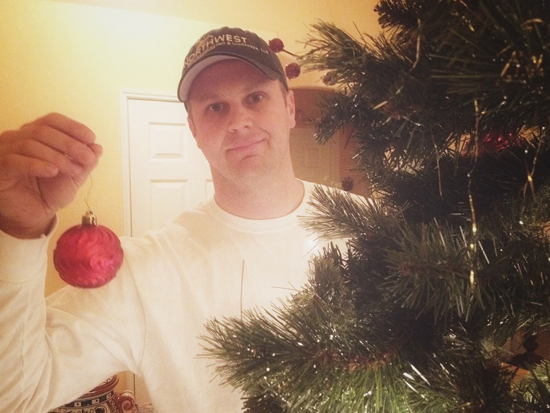 We encourage you to skip the Home Depot tree and shop local. By doing so you support the people in your community and grow your local economy. For us, there’s no place we love more than Olmsted Tree Farms. They’ve been in business since 1968 and have six locations throughout Central, South and North Kitsap, including two U-cut farms. 2) Our second tip is to attend Winterfest in downtown Bremerton on Friday, December 5th from 5-8pm. 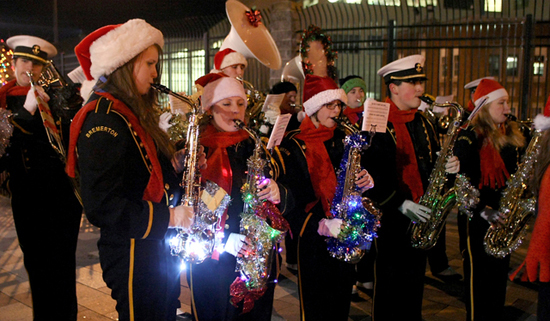 Sweet Adeline carolers will be singing holiday tunes in the street, and the BHS marching band will make an appearance as Santa arrives by fire truck at the Naval Museum at 5:30pm. Kids and adults can catch a free, horse drawn carriage ride at Pacific & Burwell, and the tree lighting in Manette happens at 7pm. Shops and art galleries will be open late, offering hot cocoa and goodies so sweet. Santa’s at The Vintage Housewife in Poulsbo on Saturdays in December. 3) Celebrate Christmas in Kitsap by – surprise, surprise – snapping a photo with Santa. 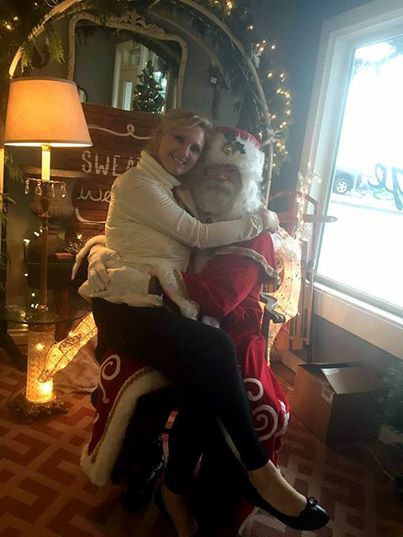 Our sister Courtnee Stevenson is the owner of a brilliant home décor shop on Front Street in Poulsbo, The Vintage Housewife, where Santa will be on Saturdays throughout the month of December from 11am – 3pm. Stop by for a twofer – get some holiday shopping done while the kids get a photo with Santa. To add to all of this holiday fun, carriage rides are also available. 4) Our fourth idea is to head to The Brothers Greenhouses in Port Orchard. If you’ve never been, Christmas is a great time to do so. Not only do they grow all of their poinsettias available for sale on site, but they’ve recently built a woodland, hobbit-inspired, tiny house, just in time for the holiday season! 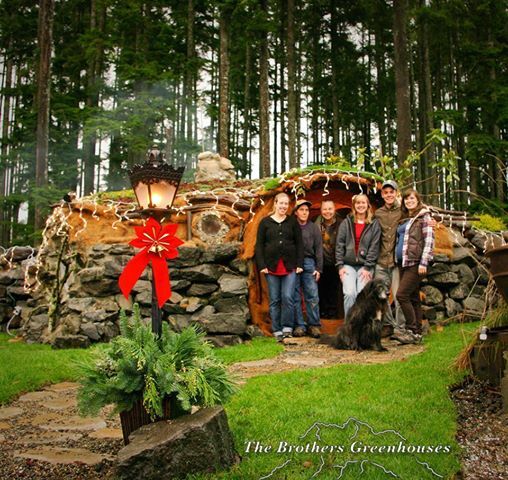 Tour the hobbit house, take a group photo, and shop for the garden lover in your life at their gift shop. 5) It seems that tiny is a trend for Christmas in Kitsap, as our final tip is to head over to The Bloedel Reserve on Bainbridge Island to check out their winter holiday village. 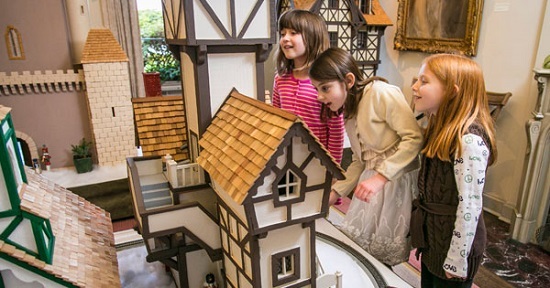 This is the fifth year that their treasured Visitor’s Center will be transformed into a miniature village comprised of handcrafted, intricately designed buildings and electric trains, sure to capture the hearts of young and old alike. This holiday exhibit is included with admission and available for viewing from December 12th – January 4th from 10am – 4pm. From all of us at Northwest Construction & Landscape, LLC, we wish you a fantastic holiday season and a very Merry Christmas in Kitsap!